Registration for fall quarter classes in Wexford University’s online bachelor’s degree in health and fitness is now open, with classes starting Sept. 27. 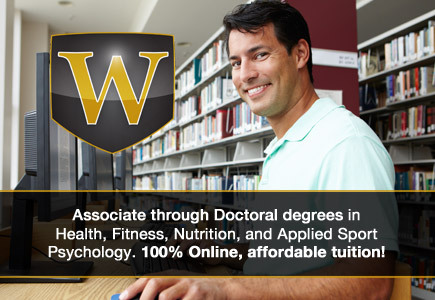 Wexford University offers a variety of online degree program, from associates through doctoral degrees, in the health, fitness and wellness fields. Making back to school easier than ever for fitness fans, Wexford University recently opened online registration for online fall classes in its bachelor’s of health and fitness degree program at http://wexford.edu/degree-programs/bachelor-of-science-degree-in-health-and-fitness/. Classes in the flexible degree program begin Sept. 27. The Health and Fitness degree program was designed to prepare students for a career in the health, fitness or wellness industries. Careers can include wellness consultant, health club administrator, corporate wellness director, fitness/wellness entrepreneur and other related fields. Students advancing to a graduate degree or professional designation will find opportunities in a wide range of career choices, such as exercise scientist, sport psychologist, kinesiologist, health educator, clinical exercise physiologist, physical therapy and other related fields. “Back to school can be a very busy time for individuals and families. At Wexford, we focus on making the application and registration process as well as the learning process more streamlined, so you can focus your time and energy on a career that you will love,” Bauerle added. Courses in the online bachelor’s in health and fitness degree program include Kinesiology, Organic Chemistry and Biochemistry, Research Methods in Exercise Science, Introduction to Sport Psychology, Biomechanics, Advanced Nutrition, Concepts in Group Exercise, Ethics and Sport Management and more.